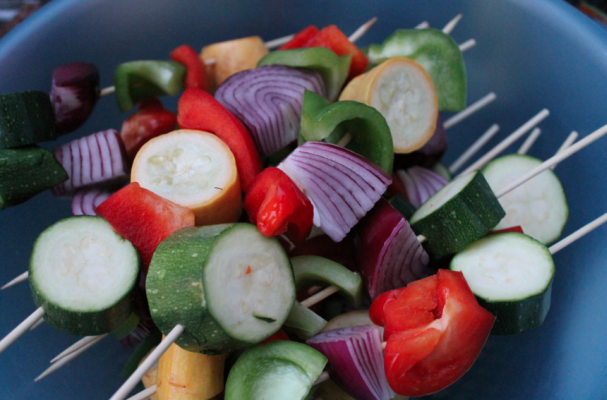 Sweet and sour rainbow vegetable skewers are a quick and easy summer side dish. This versatile recipe can be done with just about any vegetable you have handy in the fridge. I love to use my homemade sweet and sour sauce to add a layer of flavor but you can also do these skewers plain with salt and pepper and it would still be delicious. Step 1: In a large bowl, add the sliced vegetables and toss with oil, salt and pepper. Thread the vegetables onto a skewer in rainbow order. Step 2: Preheat the grill to 400 degrees Fahrenheit. Cook the vegetables on medium high heat until slightly charred and beginning to soften. Using a pastry brush, glaze the vegetable skewers with the sweet and sour sauce. You want to do this step just before the skewers are done cooking or else the sugars in the sauce will burn. Remove from heat and let cool.